Here’s a classic from my early days playing ‘ukulele and figuring out songs from the radio. 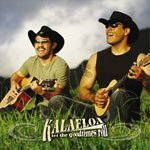 One of the most ‘ukulele-centric bands in Hawai’i at the time was Kalaeloa. So naturally I bought their CD and figured out all the songs. Of all the tunes on the album, Kiss You in the Morning was one of the most well-played and the one that got covered the most.